Years ago, we introduced the CID-1 Customer Interface Device in response to continued requests from customers for a low-cost convenient termination device which would provide over current protection. It was followed a year later by the CID-2, a two-channel version of the popular low-cost interfacing device. A few more years have gone by, but it’s that time again! In response to customer requests, we’re introducing the CID-3, a three-channel termination device. The CID-3 is designed for applications where three channels of pulses are used, usually for WATTS delivered & received, and for VARS delivered. Not every pulse metering application is the same, of course, but the CID-3 allows for flexibility in the convenience of having termination points to land wires, in addition to providing current limiting to protect the KYZ pulse outputs of the meter. While the CID series does not provide the optical dielectric barrier protection of an isolation relay, it is the next best thing by adding current limiting and transient voltage protection to the circuit. Following the trend in the market of using only 2-Wire (Form A) pulses, the CID-3 has three independent channels that can be used in two different configurations: 3 Form A channels or 1 Form C and 1 Form A channel. 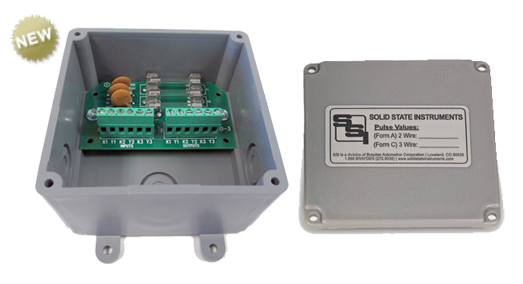 Contact us today to discuss this newest addition to the Solid State Instruments CID lineup.